South Korea's government said Friday that it has decided not to revoke Jin Air's license, ending weeks of business uncertainty for the low-cost affiliate of Korean Air Lines Co. over its illegal appointment of a foreign national to its board of directors. The company, however, appointed Cho Hyun-min, an American citizen and the younger daughter of Korean Air Chairman Cho Yang-ho, to serve as a board member of Jin Air between 2010 and 2016. 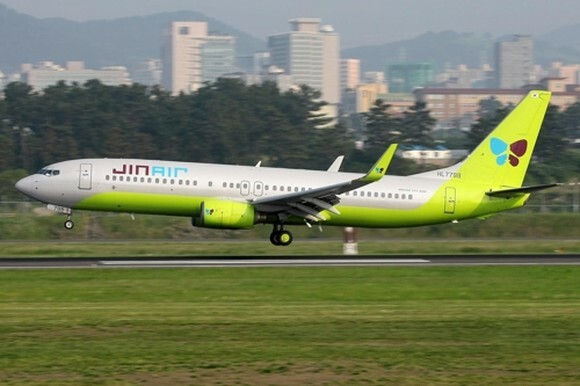 On Friday, the Ministry of Land, Infrastructure and Transport said it made the decision to allow the low-cost carrier to stay in business after holding a series of meetings with Jin Air officials and legal and other relevant experts on the fate of the carrier. "We have decided not to cancel the license as negative ramifications, such as job insecurity and inconvenience of customers ... far outweighed social benefits of revoking the license," the ministry said in a statement. The widely expected decision came as a relief to about 2,000 Jin Air employees and is in line with South Korea's efforts to create jobs for young people. The unemployment rate for young adults -- those aged between 15 and 29 -- was 9.3 percent in July, much higher than the overall jobless rate of 3.7 percent, according to government data released on Friday. Jin Air hailed the ministry's decision and vowed to make further efforts to become an airline that keeps customers and safety as top priorities. Despite allowing the airline to stay in operation, the ministry said it will restrict approval of new air routes by Jin Air and the registration of new airplanes, as well as the arrangement of non-regular flights. The ministry said the punitive steps will remain in place until after Jin Air is found to have normalized its management by faithfully improving its corporate culture and taking steps not to again violate the law. Jin Air's labor union pressed Chairman Cho and others members of his family to cease meddling in the management of the budget carrier and to offer an apology to all employees for causing the trouble. Jin Air hit turbulence in March when the younger Cho allegedly threw water in the face of an ad agency manager during a meeting in a fit of anger, behavior that sparked public outrage against the controlling family of Korean Air and Jin Air. Cho Hyun-min is the younger sister of Cho Hyun-ah, who gained global notoriety for the "nut rage" incident in 2014. Cho Hyun-ah forced a plane back to the boarding gate at New York's John F. Kennedy International Airport because she was upset with the way her nuts were served -- in an unopened bag instead of on a plate. Cho Yang-ho and his wife -- Lee Myung-hee -- were also questioned over separate allegations. In April, South Korea's customs service raided the Korean Air headquarters over suspicions that Cho's family members sneaked luxury goods into the country without paying duties. Also Friday, the ministry said it has decided not to revoke Air Incheon Co's license, though a Russian national served as a board member between 2012 and 2014. Air Incheon is a specialized air cargo carrier that is focused on the Russia Far East market, Japan, China and Mongolia. It operates a fleet of three planes made up of two B737-400F and a larger B767-300BCF jet. Source from the Yonhap.